The Baptistery of St. Lydia located 15 km from the city of Kavala and next to the archaeological site of Philippi. 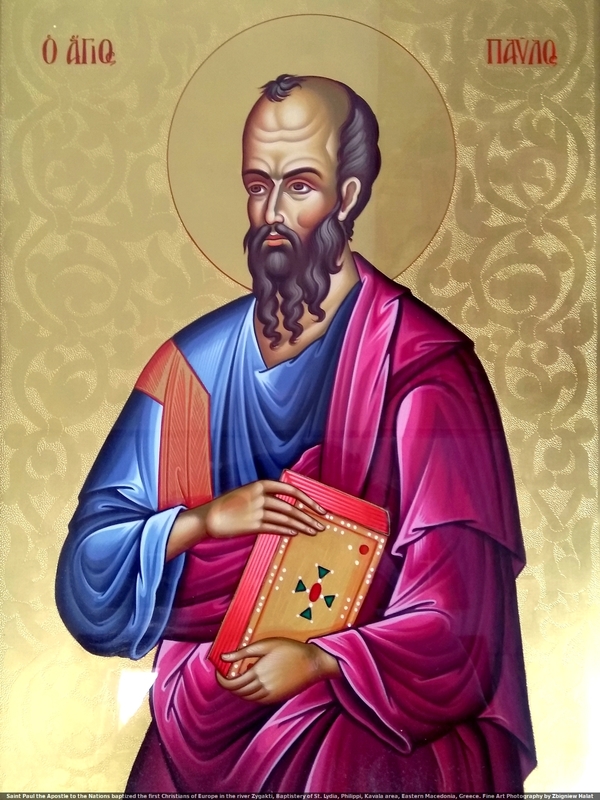 There, in the river Zygakti is the point where Sant Paul the Apostle baptized the first Christians of Europe, Lydia and all the people living in her house. 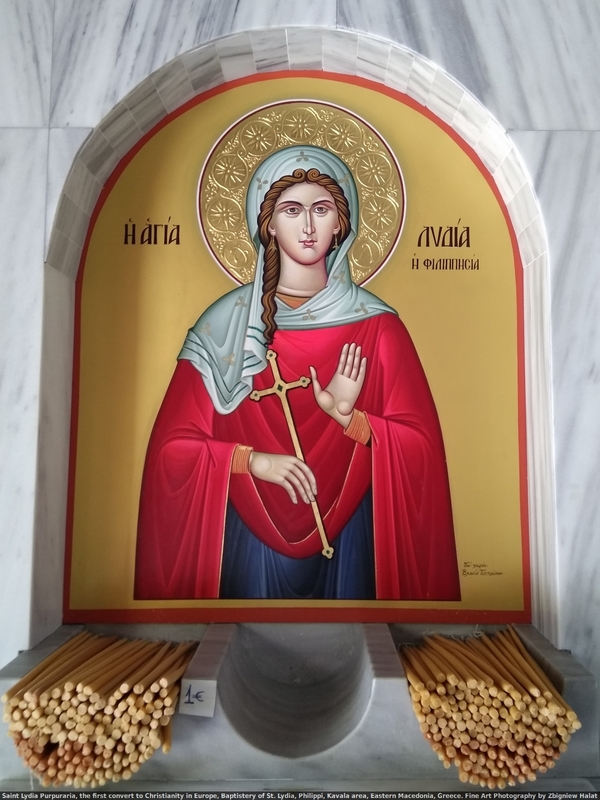 Lydia of Thyatira was the apostle Paul's first convert in Philippi and thus the first convert to Christianity in Europe. 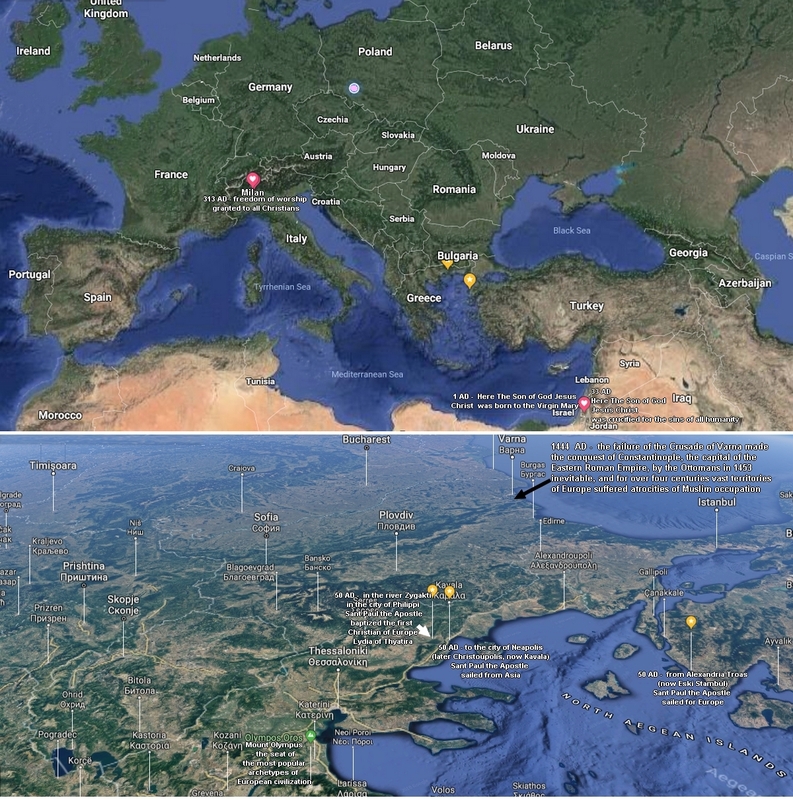 50 AD - from Alexandria Troas (now Eski Stambul) Sant Paul the Apostle sailed for Europe; 50 AD - to the city of Neapolis (later Christoupolis, now Kavala) Sant Paul the Apostle sailed from Asia; 50 AD - in the river Zygakti in the city of Philippi Sant Paul the Apostle baptized the first Christian of Europe, not far from Mount Olympus - the seat of the most popular archetypes of European civilization; 313 AD freedom of worship granted to all Christians; 1444 AD - the Battle of Varna, the final battle of the Crusade of Varna on 10 November 1444 made the conquest of Constantinople, the capital of the Eastern Roman Empire, by the Ottomans in 1453 inevitable, and for over four centuries vast territories of Europe suffered atrocities of Muslim occupation. 11 We left Troas in a ship and sailed to the island of Samothrace. The next day we sailed to the city of Neapolis. 12 Then we went to Philippi, a Roman colony and the leading city in that part of Macedonia. We stayed there for a few days. 13 On the Sabbath day we went out the city gate to the river. There we thought we might find a special place for prayer. Some women had gathered there, so we sat down and talked with them. 14 There was a woman there named Lydia from the city of Thyatira. Her job was selling purple cloth. She was a worshiper of the true God (lit. whose heart the Lord opened i.e. a non-Jewish convert to Judaism). Lydia was listening to Paul, and the Lord opened her heart to accept what Paul was saying. 15 She and all the people living in her house were baptized. Then she invited us into her home. She said, “If you think I am a true believer in the Lord Jesus, come stay in my house.” She persuaded us to stay with her. 1683 AD - the Ottoman Empire reached its greatest extent in Europe; After the Battle of Vienna, 12 September 1683 under the command of King of Poland John III Sobieski the Muslim Ottomans ceased to be a menace to the Christian world. TRANS-BLACK SEA SLAVE TRADE - SAQALIBA SLAVE HUNTING ONE OF THE GREATEST ATROCITIES IN HISTORY. Altogether more than 3,000,000 people were captured and enslaved during the time of the Crimean Khanate.The Central and Eastern European Slavic slaves were cruelly treated by the Muslims: tortured, mutilated, forced to work in inhuman conditions, sadistically killed when found useless. The abducted Slavic children, adolescents and women were condemned to be brutally and systematically raped to satisfy lust of their owners.